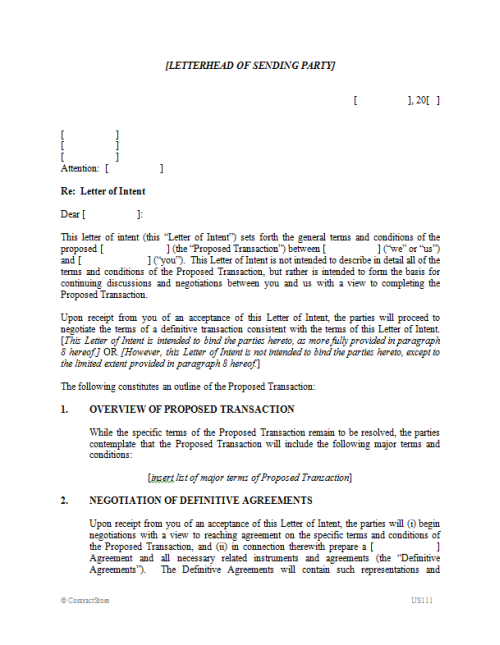 A form of letter of intent, designed for use when U.S. law applies, this document is formatted as a letter from one party to the other and contains both binding and non-binding language. The document is flexible enough to accommodate almost any type of transaction where U.S. law applies. 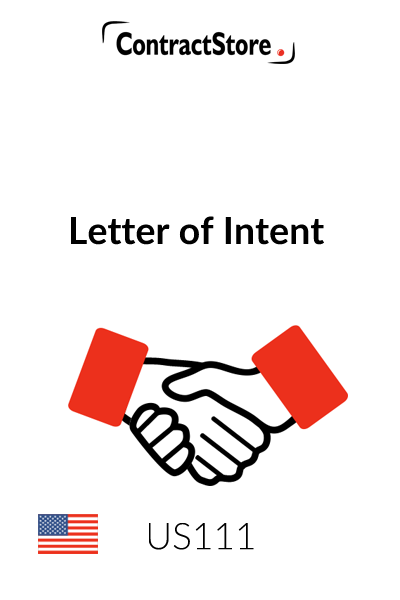 This form of Letter of Intent is designed for use as a preliminary agreement between two parties that are contemplating entering into a binding business relationship. It is set up to be printed on the letterhead of one party, and to be sent to and countersigned by the other party. For simplicity, the parties are referred to as “us” (the sender of the letter) and “you” (the recipient of the letter), though these terms can be customized to reflect the names of the parties by use of the “find-and-replace” function in a word processor (in Microsoft Word, press “Ctrl” and “h” together). There are numerous reasons why the parties might want to express their expectations in a letter of intent prior to commencing detailed negotiations. Among these are: to lay the ground rules for the contract negotiation (including framing the key issues for the negotiation); to bind the parties to certain key contract terms before the detailed negotiation has begun; to make sure that the parties are even “on the same page” before committing resources to a negotiation; and/or to limit the ability of one or both parties to “shop” the transaction to third parties during a pre-defined negotiation period. Letters of intent can be either binding or non-binding, though most fall somewhere in between. 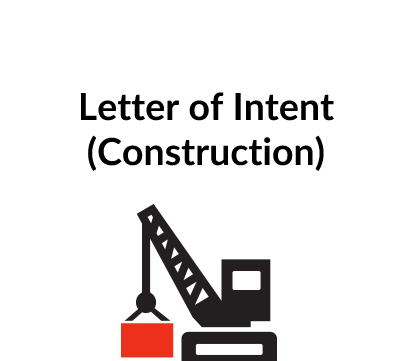 The most common complication with letters of intent occurs when the letter of intent is either less binding or more binding than one or both of the parties intended. Another issue is the tendency of a letter of intent, even though expressed to be non-binding, to lock the parties into their pre-existing negotiating positions. As a result, careful attention to the wording of a letter of intent is advised. • Completely binding – here the parties have committed themselves to negotiating in good faith to reach agreement as to the terms of the ultimate business relationship. A completely binding letter of intent may be accompanied by earnest money or a “break-up fee” – a sum of money that one party may be obligated to pay or forfeit to the other in certain circumstances where the parties do not reach agreement. Unless otherwise limited by the language of the letter of intent, the failure of the parties to reach agreement can also give rise to a dispute as to whether one party is in breach of the letter of intent and therefore liable in damages to the other. • Partly binding – it is possible for parts of a letter of intent to be binding and other parts to be non-binding. For example, the confidentiality and “no-shop” clauses may be binding, but until the letter of intent expires or is terminated, the only obligation of the parties may be to negotiate. Termination rights will typically be quite permissive. • Completely non-binding – this is little more than a termsheet, which has no legal binding effect unless such effect can be implied from the conduct of either or both parties. This form can, with appropriate modification, be used in any of these contexts. This form provides a good starting point for preparing a first draft of a Letter of Intent. However, as with use of any form, it is very important to take the time to read the form in its entirety to ensure that it is customized appropriately for use in your individual situation. For all but the simplest of transactions, it can be anticipated that some customization will be in order; and as mentioned above, it may also be advisable to consult with competent legal counsel. This letter of intent is set up to be printed on the letterhead of one party. The date and the name and address of the recipient party should also be inserted at the head of the document. For simplicity, the parties are referred to in the first (un-numbered) paragraph as “us” (the sender of the letter) and “you” (the recipient of the letter), though these terms can be customized to reflect the names of the parties by use of the “find-and-replace” function in a word processor (in Microsoft Word, press “Ctrl” and “h” together). The extent to which the letter of intent binds the parties is introduced by the second sentence of the second (un-numbered) paragraph, with a cross-reference to paragraph 8. The bracketed language alternately offers binding and non-binding language, and the language that is not used and the brackets should be deleted. 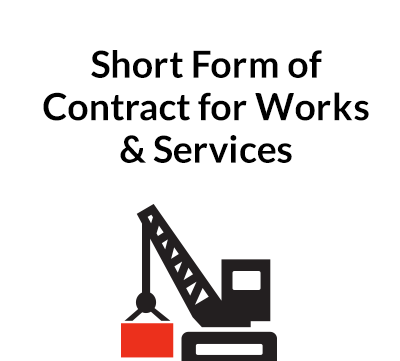 If the letter of intent is intended to bind the parties, then as a matter of good practice the particulars of the terms of the proposed transaction should be laid out in paragraph 1 in as much detail as can be agreed upon. Paragraph 1 presents an overview of the proposed transaction. This paragraph should be completed with a list of the key terms of the transaction, in such detail as reflects (i) the level of consensus that the parties have reached to date, and (ii) the nature of the letter of intent (i.e., completely binding, completely non-binding or somewhere in between, with greater detail perhaps being appropriate if the letter of intent is intended to be binding). Paragraph 2 sets out a brief roadmap for the parties’ obligation to negotiate to reach agreement as to the terms of the proposed transaction, and in connection therewith to enter into definitive agreements. Paragraph 3 contains language that may be customized to memorialize the expense-sharing arrangement between the parties. The possibilities include: one party bears all the costs (not very common); each party bears an equal share of the costs; each party bears its own costs (perhaps the most common arrangement). Paragraph 4 contains alternate confidentiality provisions. The first option is a short form confidentiality provision which may be adequate in many cases. If more detailed, customized or extensive protection is required, consider using the second option – a free-standing Nondisclosure Agreement (a form of which is available elsewhere on the ContractStore website). Paragraph 5 restricts the issuance of press releases relating to the proposed transaction. Paragraph 6 sets forth timing issues relating to (i) completion of definitive agreements and (ii) closing of the transaction. This provision uses “attempt” language, which should be tightened if the parties want to be bound by a particular time-frame. Paragraph 7 is a short form exclusivity/”no-shop” and business standstill provision which is general enough be adequate in most cases. The language for paragraph 8 provides for the letter of intent to be, in the alternative, binding or non-binding. The binding version subjects the parties to an obligation to negotiate in good faith, which leaves some room (albeit vague) for manoeuvre, should the parties be unable to reach agreement. The non-binding version allows either party to terminate the letter of intent upon a defined number of days notice to the other party. The non-binding version nevertheless provides that some paragraphs are binding on the parties (such as the confidentiality, expense-sharing and standstill provisions). The language in the version that is used should be tightened or loosened as to binding effect in accordance with the agreement of the parties. The version that is not used and the brackets should be deleted. In case the parties enter into a binding letter of intent and want to use some kind of a “break-up” fee, paragraph 9 provides for payment of earnest money to an escrow agent. The money will, depending on the circumstances, be credited to the payor, paid to the payee or returned to the payor. In general, care should be taken with the language used in this provision, as the amount of money at stake could be quite high, in some cases as much as 10% of the transaction value (depending on the agreement of the parties). Paragraph 9 or 10 (the number depends on whether the earnest money provision is left in the letter of intent) contains a fairly standard choice of law provision which picks the laws of a single state (applicable federal laws apply regardless of the state law election). The dispute resolution clause provides for dispute resolution by litigation. This letter of intent is set up to be printed on the letterhead of one party, and to be sent to and countersigned by the other party. The form anticipates that the sending party will set a deadline by which acceptance must be received, failing which the letter of intent will lapse. The form also reserves the right of the sending party to revoke the letter of intent at any time prior to timely acceptance. The signature blocks are set up to accommodate execution by corporate parties. The italicized language in brackets is for guidance only and should be deleted.